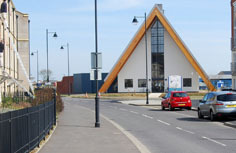 Cambourne Church is a partnership of the Anglican, Baptist, Methodist, United Reformed and Roman Catholic Church. “We are a growing church in the new community of Cambourne. We meet in The Hub Community Centre for Sunday services. Cambourne Church is currently involved in two major projects: the fundraising campaign is underway towards building a new church centre, which will also provide much needed community space in the area. The Vine Inter-Church School (supported by the Anglican and Methodist churches) opened its doors in September 2005, a project which was brought forward a whole year to accommodate the rapidly growing numbers of children in Cambourne.